As previously planned, I have gone back to Place de la Concorde for more photos, but with a promise that they’ll look different. Today, we are getting a view towards the north, with clear image of the fountain at this public square and a couple of landmark buildings at the background. This fountain is called Fountain of the Rivers, with allegorical figures representing rivers Rhône and Rhine, surrounding by figures alluding to wheat, grapes, flowers and fruits, the main harvests of France. 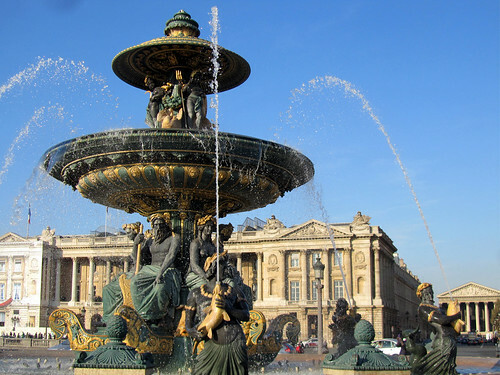 The classical and majestic building behind the fountain is Hôtel de Crillon, formerly a palace but today one of the luxury hotels of Paris with its own Michelin-starred restaurant. To the right corner of the picture, you’ll see La Madeleine, a church built as inspired by Maison Carrée of Nîmes. I’ll come back to La Madeleine another day. After all the temple overload, here’s a change of image. I was up at Montmartre and spotted this church just across from Abbesses métro station – the Église St-Jean-de-Montmartre. Many would also call it Église des Abbesses, given its location, which makes it confusing for non-locals. Initially, I was wondering myself if the two names refer to the same church. I love the bright colours used to stain this series of glass panels. The use of iconography here is very much along the classical line, but these glasses have been painted with clear landscape and swirling sky, a scene that is not typical for this depiction of Christ’s cruxifixion. At least none that I recall. 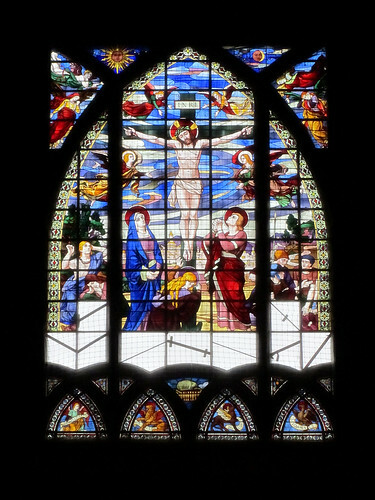 Of course, one can argue, after countless of stained glass seen, how could I remember the details from one to another? It’s true, you know. Remember my recent greedy/wild photography mission? 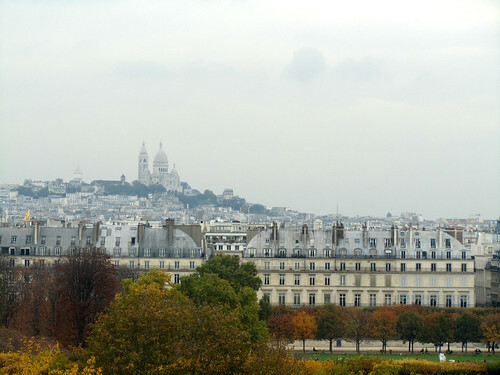 Here’s a new shot of Montmartre and Sacré-Cœur, and today the view point is none other than the newly-opened 5th floor gallery of Musée d’Orsay! After a week of strike action by the staff of the museum, it finally reopened on Thursday and I made good use of my MuséO card to gain entrance for a look at the new gallery. From this shot, in the foreground, you can see Jardin des Tuileries in full autumn glory and the adjacent buildings of rue de Rivoli. But note the tiny golden statue at the left hand side, just peeking above the roofs. I’ve tried magnifying the photo to check, but couldn’t quite make it out. I’m deducing one of the golden sculptures above Opéra Garnier, but I can’t be absolutely certain. There’s something odd that makes me doubt this deduction. It needs further confirmation. 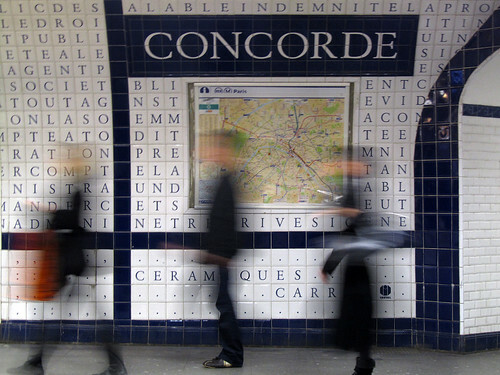 At the first glance, the walls of the Concorde station (for métro line 12, not 1 nor 8) seem to contain a whole bunch of decorative and alphabetised tiles, but surely that cannot be. If you take a little time though, words start to jump out, in French, but trying to make sense of it all is quite a daunting task. Without punctuations and spaces, to a non-native speaker like me, after a couple of lines, I was quite lost. These tiles actually carry extracts from the Declaration of the Rights of Man and of the Citizen (Déclaration des droits de l’homme et du citoyen), a document dated back to the days of French Revolution. (Back then, however, they forgot women’s rights.) This was put in place in 1989-1991 during the renovation of the station by Françoise Schein. 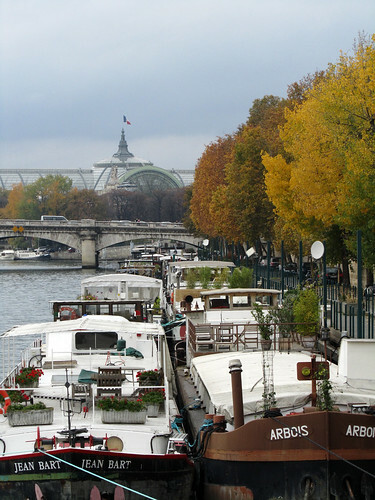 I like it how these péniches are so well lined up along the River Seine (at authorised quay sides of course), and the little touches the owners put to make them as homely as possible. In the horizon, Grand Palais looms large. 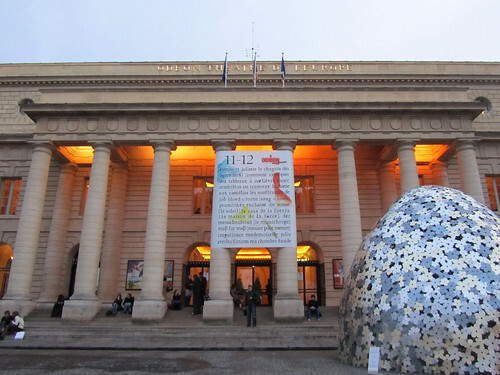 It is currently hosting an exhibition of Matisse, Cézanne, Picasso… the Stein Family. Should be a good one, and I need to find time to go over. 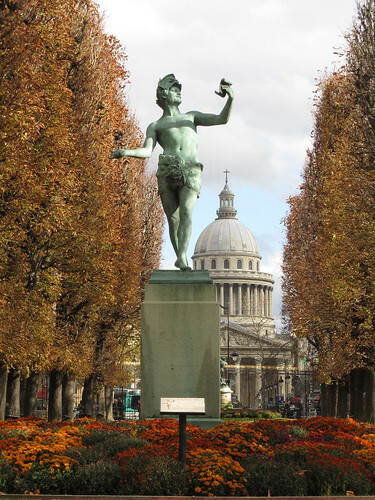 Now that autumn leaves are showing their colours, I could not resist going back to Jardin du Luxembourg, to this spot where I have in past love the view it afforded me, with colourful flower beds and the Phanthéon standing proudly in the background. This sculpture represents a Greek actor in rehearsal, with the manuscript in his hand containing the lines that he ought to learn, and a mask that will disguise his true self once drawn over his face. I do wonder if it is a tragedy that he’s rehearsing for, or perhaps something more cheerful instead? This egg-shaped igloo-looking sculpture – yes, you can walk in and it’s taaaaall at 5.5m in height – is a work in oxidised aluminium by Andrea Salvetti. Mazzolin di fiori (bouquet of flowers) is made entirely of cut metal sheets of, well, flowers (5 petals each). It is pretty to look at, but not to seek shelter when it’s raining. It’s a bit leaky. Not sure how long Avant-Scene will sponsor its existence so if you want to check it out, make it quick. 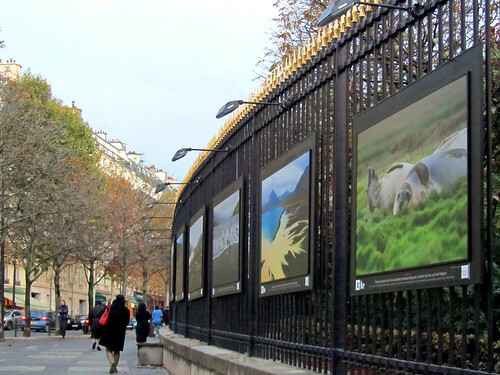 I have just got round to look at the photos currently on exhibition along the Jardin du Luxembourg. It started about 6 weeks ago, of which I was away for a good couple of them. Entitled Cœurs de nature en France, this exhibition will run in two waves – the first from 15 September to 4 December, and the second from 6 December to 15 January 2012. I don’t normally go to a bar at 10am, least to say on a Sunday morning at that too. Today is an exception. My friends and I need a place to watch the Rugby World Cup final match between host New Zealand and the challenger France. Our original intended location had problem with their tv set so there was a small frantic search for a new place nearby and quickly. 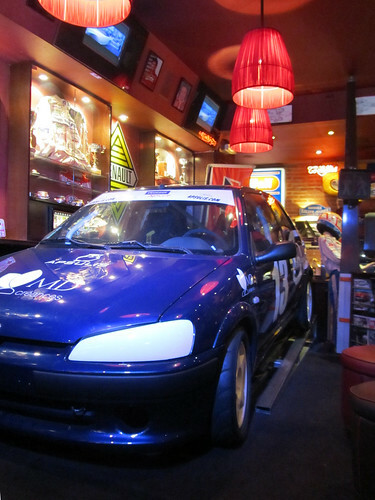 We found a bar that is quite sports-themed, in particular, motorsports. It doesn’t really matter, as long as there are live broadcast of the match. But during the break, I surveyed around. It is a rather impressive interiors that they’ve got here, complete with even a car right smack in the middle of the bar. In a city where space is at a premium all the time, this form of use of space is unusual, but I guess that’s also what makes it special. They’ve definitely got the passion for all thing auto. Gimme gimme gimme gimme gimme chocolates! This year, it’s busier than ever. I don’t remember the salon being packed at 10.30am in the past, but it is now. Anything wonderful that can be created using chocolate, can be found here. 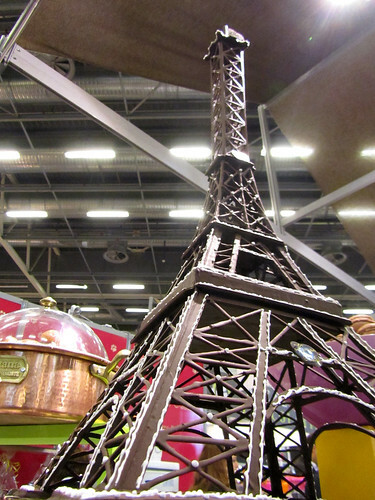 Dresses, replicas of Arc de Triomphe and Eiffel Tower, beloved carton characters – they are all somewhere in the exhibition hall this weekend! My haul this year? Quite reasonable compared to the past. At least I believe so, hehehe. A couple of bottles of chocolate wine, some chocolate selections, a couple of boxes of pralines, and discounted Gü products.